In mensuration we shall study about some other curves, viz., circles, ellipses, parabolas and hyperbolas. The names parabola and hyperbola are given by Apollonius. These curves are in fact, known as conic sections or more commonly conics because they can be obtained as intersections of a plane with a double napped right circular cone. These curves have a very wide range of applications in fields such as planetary motion, design of telescopes and antennas, reflectors in flashlights and automobile headlights, etc. Now, in the subsequent sections we will see how the intersection of a plane with a double napped right circular cone results in different types of curves. 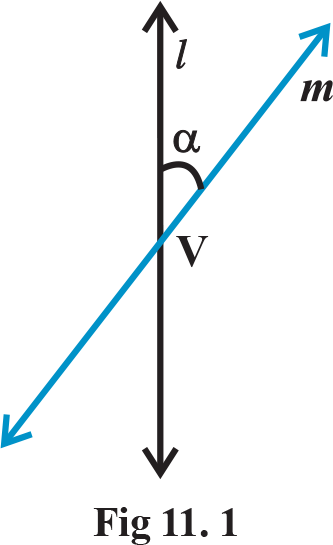 The point V is called the vertex; the line l is the axis of the cone. 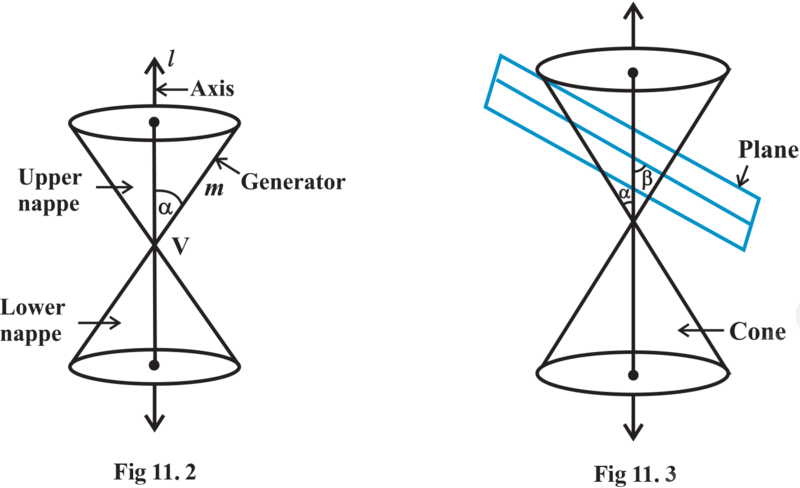 The rotating line m is called a generator of the cone. The vertex separates the cone into two parts called nappes. If we take the intersection of a plane with a cone, the section so obtained is called a conic section. Thus, conic sections are the curves obtained by intersecting a right circular cone by a plane. We obtain different kinds of conic sections depending on the position of the intersecting plane with respect to the cone and by the angle made by it with the vertical axis of the cone. Let β be the angle made by the intersecting plane with the vertical axis of the cone (Fig11.3). The intersection of the plane with the cone can take place either at the vertex of the cone or at any other part of the nappe either below or above the vertex.